So Paper Magazine published a response to the Vogue article. It's told from a queer perspective. The truths still hold value for the straight community though. Yet another telling from the queer perspective does not exactly advance the cause of broad acceptance of men in heels. The worthy thing about the Vogue article was that it wasn’t told from the queer perspective. Deepening the connection between being gay and wearing heels isn’t terribly helpful for opening up the broader community to the idea of wearing heels. "When I wear heels it's not me being trendy or trying to attract attention, it's me expressing myself. I don't think of wearing heels as much of a big deal. It's normalized to me because I don't hold onto the toxic gender norms held over everyone's heads. In fact when I do wear heels I'd rather not have people comment on them. It sometimes can feel like I'm getting a pat on the back from a cis person for going against the gender binary, and things like that don't move us forward but set us back." "'Be you're own cheerleader' — Suzanne Farrell. I grew up with and still live by the saying, 'Treat others the way you want to be treated.' All we have is right now, so why not live your truest self." "It doesn't matter what gender is wearing the heels. All that really matters is, if they can SLAY in them." "Heels on the male body isn't just a fashion trend as it has been around since heels were invented. As a gender nonconforming person, wearing heels has allowed me to feel powerful in spaces where I'm otherwise made to feel small and unseen." "Personally, I believe the most masculine thing a man could do is wear a dress with a pair of heels and not be afraid to embrace his inner femininity." Sounds like me all over, and yes, I agree with that sentiment one hundred percent. Less than impressed with the photography, although obviously the photographer was constrained by the lighting and set-up of the exhibition. Sorry SF, when you wear high heel shoes you are on the spectrum. But not very far. I on the other hand are further down that spectrum on a daily basis. Although much of what I wear might start in the women's section, once I wear it, it becomes a man's clothes. I think there is a clear distinction between so-called "bent gender" and transgender. Perhaps that's where the hangup is. But then again, I suspect there are other influences out there on some people's opinions. There is no question that all of us here are bending traditional gender rules. Absolutely! Transgender surely implies a physical (surgical) transition to resemble (in some views 'achieve') the other gender. Anything else is some degree of cross-dressing or transvestism to adopt alternative-gender clothing and/or appearance, whether to pass as that other gender or not. An interesting article. Well, all things considered, I don't mind being on that particular spectrum, in fact, I cherish that distinction. 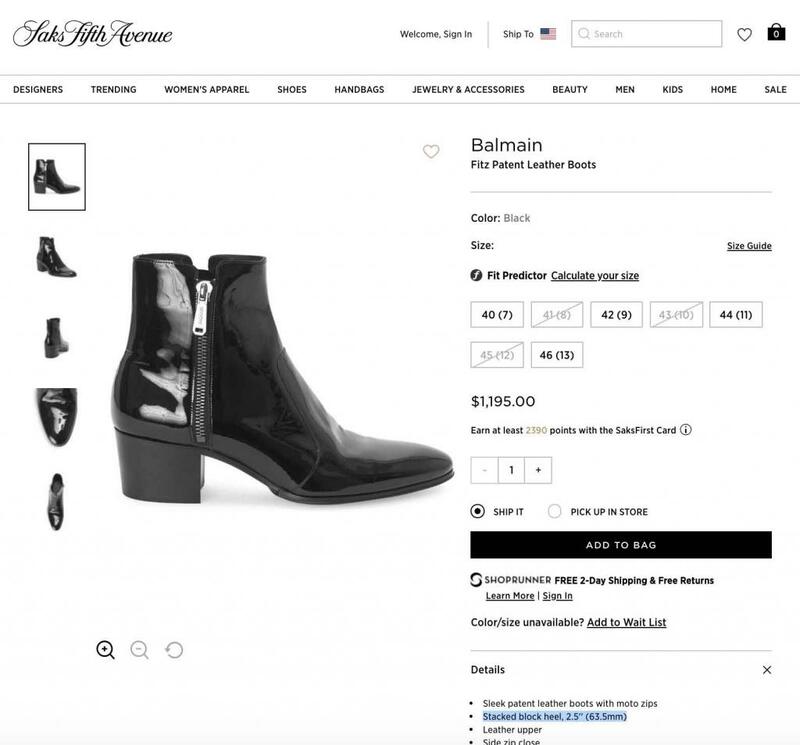 Variations of this Balmain boot with a 2.5" heel are being sold at Neiman Marcus and Saks Fifth Avenue. 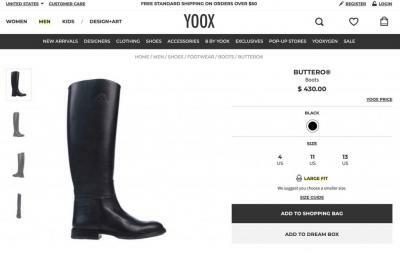 The riding boot for men being sold at Yoox competes with price points from Tory Burch for similar riding boot style from women's department.